As John loved a life of silence and quiet, he wished to be clothed in the monastic schema and decided to found a monastery with the inheritance he had received from his parents. Upon the advice of his brother Gabriel, he first built a wooden church dedicated to the most pure Mother of God, in memory of the honorable Annunciation. Having surrounded the monastery with a wall and provided all things necessary for the monastic life, he now hastened to build a stone church. But after he began this good work by laying the foundation of the stone church and erecting the lower half of the building, he was left with insufficient funds to complete its construction. 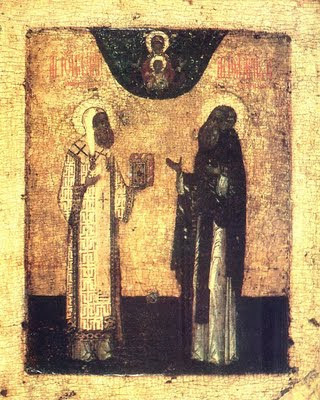 The blessed John and his brother Gabriel were deeply grieved. Since they had ardent faith in the most pure Theotokos, they looked to her in their sorrow as a helper and comforter. They hastened to her in tears, praying and saying, "Thou knowest, O Lady, our faith and our love for thy Son and our God. We labour with all fervour and faith to build a temple to thy glory, and in thy succour, O Mother of God, do we place our hope. Help us to complete thy temple, and send down thine aid; and do not permit us, thy servants, to be put to shame, for we have begun to build and are not able to complete our task without thine assistance." As they prayed and lamented, the most pure Mother of God, the heavenly Queen, appeared in a night vision to them as they slept and said, "Why do you sorrow and weep thus over the building of my temple, O beloved servants of God? I will not disdain your supplications nor your faith and love but will soon provide you with what is needful and with more than what is needful for the completion of the church. Return quickly to your task, and do not allow your faith to weaken." Both brothers saw the vision, and they rose quickly, filled with joy. After Matins, they related to one another what they had seen and were strengthened in hope. Early in the morning of that same day, having, by God's providence, gone outside the monastery, they saw a most wondrous steed in gold-covered bridle standing before the gates of the monastery. Its saddle was also covered with gold, but he carried no rider. The horse stood quietly, and they marvelled at his beauty and majesty. They waited a long time, but the rider of the horse did not appear. When they realized that no one was coming and yet the horse stood in the same place without moving, they approached it and saw two heavy-laden bags suspended from either side of the saddle, and immediately the horse disappeared from before their eyes. The brothers untied the bags and found one filled with gold and the other filled with silver. Marvelling at God's care for them and that of the most pure Mother of God, they sent up great thanksgiving. Soon the church was completed and magnificently adorned, and the monastery was able to purchase numerous villages. The remainder of the gold and silver they gave to the abbot and the brethren. They were then clothed in the monastic schema, John receiving the name Elias, and Gabriel, Gregory. They lived in that monastery in a manner pleasing to God in fasting, prayer, and every monastic struggle and labor. From The Great Collection of the Lives of the Saints by St. Dimitri Rostov (Vol. 1, Sept. 7).